1. That H&M terminates Joseph H. (the individual who made the anti-Asian, xenophobic, and misogynist verbal attack) AND discipline the managers who did not quickly intervene. 2. That H&M changes and enforces its cultural diversity classes. 3. That H&M recognizes and understands that ignorant and racial remarks towards H&M customers from H&M employees should never ever be tolerated. 4. That immediate and serious intervention should take place from an H&M manager when a complaint about an H&M employee is made by an H&M customer regarding a racial remark from the H&M employee. I will not shop at H&M until this is resolved. As a customer, I should be able to go shopping at a retail store without being verbally abused by an employee who uses racial slurs. please sign the petition and pass the word on... Boycott H&M!!! i don't know what the organizers of the protest thought, but i was really happy with the turn out and the energy, positivity and dedication that the protesters brought with them. the majority of the protesters were filipino/asian but there were caucasian, latino and african american protesters too. every once in a while, passersby would stop to see what the protest was about and then actually ask for a sign to help protest. "2, 4, 6, 8, H&M discriminates!" there were about five people near the front door passing out flyers about the protest and i saw how they persuaded customers from shopping there today. unfortunately, we couldn't persuade everyone not to shop at the h&m store. at one point, an older woman (and i could have sworn she was wearing a neck brace) shouted at us that she would never stop shopping at h&m. it was disappointing to see so many women of color shopping there and it was especially heartbreaking to see a handful of asian people walk in to shop. i haven't heard anything yet about whether or not H&M has taken any action re: their racist *ss employee. our local cbs news crew was there, the local filipino news show, CPR-TV was there, and there were what looked like reporters taking notes and quotes... there were also many video cameras and digital cameras out - hopefully, there will be some youtube videos. hopefully, all of our hard work will have paid off. i can't express in words how proud i was to protest alongside such great people. We wanted to post the final arrangements and clarify information regarding the protest in front of H&M on Saturday, October 6th. It will start at 10:00am and last until 11:00am! Media will be contacted and asked to cover the protest from 10:00am - 10:30am. Please meet in front of H&M, 840 N. Michigan Avenue, Chicago no later than 9:55am. Who is leading it? Family and friends of Frannie (LosBañes) Richards, there is no specific person or persons. Do we need a permit? NO; just keep moving in sync in a line and do not block the entrance ways of the stores on that block or the street. Please do not disrupt traffic. The previous tentative message & VIA Times presented a tentative time of 10:00-1:00pm. Because those were tentative times, we are informing you of when the media is informed to be there. We are hoping that you would be able to be there at that time. We apologize for such short notice. We understand that you have busy lives and truly appreciate all the support you have given to us! You are welcome to stay until 1:00pm but most of the people arriving at 10:00am are planning to leave at 11:00am. We were not expecting a huge crowd. Thank you for spreading the word! Please continue to help educate others on how discrimination towards any gender and any race is intolerable and unacceptable. We know you will act civil and that you understand this is a peaceful and informative march. Thanks again for all your time and support! has filed a discrimination complaint with the City of Chicago Commission on Human Relations, seeking redress for Frannie Richards, who says that in addition to the "mail order bride" comments and ridicule of her English, an H&M employee made mocking "ching chong" noises at her. That's racist! And when she complained to management, they refused to do anything about it. What the hell? I've heard rumors of a protest being planned for this Saturday outside the Magnificent Mile store. If anyone out there has further details about the gathering, let me know." "The non-apology apology: There's no more passive-aggressive phrase on the planet than, "I apologize to anyone who might have been offended" - which is usually followed by a long-winded explanation about why the offended party was wrong in the first place. While the phrase "I'm sorry" may come out of the apologizer's mouth, he or she wants to make it clear that you're the one who has the problem. Rosie O'Donnell is the reigning champ in this category, for her Asian stereotype "Ching-chong, ching-chong" non-apology on "The View" in December, which actually included the words 'there's a good chance that I'll do something like that again.'" in new york city... a reflection of themes...ideas and thoughts around individual and ethnic identity and how outside perspectives play into it...the final piece will debut in the spring of 2008". "I've been continually stunned to see how in very subtle ways people have been trying to create a false sense of truth by attributing Cho's "foreign-ness" as part of the answer. When we are continuously bombarded with media headlines or sound bites that use the words "Virginia Tech Massacre" and "Korean National," a subtle connection is made. The assumption is made that somehow Cho's place of birth, his immigrant status, has something to do with the massacre. It doesn't matter if the rest of an article goes on to talk about Cho's schizophrenia or troubled past or gun control or violent movies, the implication is there. Cho is a foreigner, let's get that straight from the beginning, let's make sure that's part of the conversation. I've been struggling to understand how some have found comfort in identifying Cho Seung-Hui as a foreigner, as an immigrant and as someone who is certainly not American. It's just a seemingly slight change of language, dropping the word "American" from "Korean-American" and replacing it with "national." You also put his last name first, like they do in "other" countries. There you have it; suddenly, he's not one of us. There has been a proliferation of groups on Facebook, blogs and online chatter about how Cho's foreign status should factor into the conversation about the deadliest shooting massacre in American history. I'm confused why anyone would want to discuss if Cho should be allowed to be buried in this country, or how someone would write that a "foreigner should never be allowed in this country to kill real Americans." "
i know. if you can, try to look beyond the picture at left.. I don't want to claim that being an Asian American myself makes me any expert on the subject of "Asian-American-ness"; no more than, say, being a woman helps me know more about "woman-ness" than any man does. We all have blind spots, especially when it comes to seeing ourselves. But Ching Chong Chinaman by Lauren Yee truly surprised me, in a highly entertaining and informative way. The Wongs are your notoriously typical middle-class suburban American family, set in their blissfully content and carefree ways. They are seventh and eighth generation Chinese Americans: Upton, the son, living in the world of Warcraft; Desdemona, the daughter, trying her darnedest to get into Princeton; Grace, the clueless Mom; and Ed, the work-and-golf Dad. Their insulated life gets a jolt when Upton brings home Ching Chong, and explains that the man is one of the "Indentured servants—workers from Third World countries whose time is worth far less than my own." He bought Ching Chong a one-way plane ticket to America and forged a student visa. In return Ching Chong will complete his homework, chores, and familial obligations. "Cheaper than minimum wage labor, indentured servants present a solution that is amenable to both sides." The Wongs are so culturally removed from their heritage that, when first spotting Ching Chong with Upton, Desdemona asks, "Who's that Asian guy?" Replies Grace before seeing the man, "Don't talk about your brother like that!" But before long Grace falls for Ching Chong, and Desdemona, feeling the need to get closer to her roots, sets out to be, well, more "Chinese." The play is boldly satirical and mocks all the major stereotypes—not only about Asians but also Americans. It pushes the envelope with mirth and produces big laughs. It is also an equal-opportunity offender, and there lies a problem: the characters get jeered at so much that they become thoroughly ridiculous, and that makes it hard for us to care about them. Ching Chong is not developed enough, either, to serve as a mirror or an inspiration. Although the plot is less than satisfying, the dialogue and critiquing is marvelously sharp-witted and penetrating. It turns clichés on their heads. My favorite part is about Desdemona sponsoring a Korean girl and trying to use that fact to pump up her college application. There is also a golf speech that is destined to be a classic. The cast is superb, with Jamie Yuen-Shore as Desdemona and Cirocco Dunlap in multiple roles being standouts. Director Anne Marie Bookwalter makes the scene changes as fun as the play itself, and keeps the pace snappy and tight. The stage is smartly arranged and utilized. Overall, regardless of whatever faults Ching Chong Chinaman may have, this play is too smart and funny to miss. It makes me wonder at a few things I do as Asian and American, respectively and together. And they are funny. has published a post at parenting called "race - that four letter word". in her post, she recalls two of her indelible experiences with ching chong. it's a powerful and heartbreaking post that reminds me of my own angry, fearful, hate filled memories associated with hearing ching chong. I just did a search on YouTube for "ching chong" to see what videos might be out there, while of course there were tons of videos about Rosie's "ching chong" on the View, I also found this video. 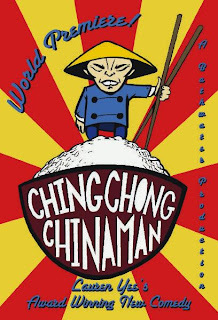 It happens that it is also a response to Rosie's "ching chong" however it is well done and interesting in its own right. Also interesting is Michelle Malkin herself whom I had not heard of before. It seems that she is a well known writer with several best selling books. On her blog about page she describes herself as a "conservative syndicated columnist" and has authored books such as In Defense of Internment. I don't think I agree with her politics ( although I should probably read more than the 10 minutes I have just spent before commenting on them ), but I did find her "ching chong" video amusing.